Tama's Iron Cobra pedals have earned a world class reputation over the past two decades. This new series bring many of the pedal's qualities and mystique within the reach of more players. This year marks the 20th anniversary of Tama's Iron Cobra pedal, a huge milestone in the life of any product. With the popularity of the company's flagship pedal higher than ever, Tama has decided to realign its mid and lower range pedals under the Iron Cobra banner, introducing the new 600 and 200 Series at this year's NAMM show. Here we look at the 600 Series. "The 600 Series features an innovative reversible cam along with components that have been borrowed from the 900 Series"
The 600 Series Iron Cobras are twin chain and feature an innovative reversible cam along with components that have either been borrowed from or inspired by the 900 Series. They're equipped with solid baseplates, twin surface beaters and available as doubles (though surprisingly no left-sided versions are offered as yet). The Iron Cobra shape recognisable today was first coined in 1998 when the second generation of IC pedals was introduced; while various tweaks and improvements have taken place since then, the basic visual blueprint remains the same. The lineage of the new pedals is unmistakable, from the classic bulging footboard to the tapered upright posts. Tama uses its black powder coating shrewdly to help demarcate between the series, sprinkling the most on 900 pedals, with smaller but significant (in the areas treated) amounts used on each model down. The 600 pedals are the only pedals of the two new series to have 'The Legend in Innovation' inscription scrolled across their footboards. Similarly, the inclusion of a hard-shell case is also limited to 600 pedals. The Duo Glide Cam is a double-sided cam that can be flipped through 180°, offering both Power Glide and Rolling Glide cams. While interchangeable cams already exist, to date they require a box of spare cams to transport around. The beauty of the Duo Glide Cam is in that it is attached to the pedal, so there is nothing to lose or inadvertently tread on. Switching the cam around requires the loosening of a single tension rod and can be accomplished in around a minute. "The new model successfully captures much of the solidity that is one of the defining characteristics of Iron Cobra pedals"
Elsewhere the 600 pedal also features the same double chain found on 900 Series Iron Cobras and the Para-Clamp, a hoop clamp that automatically adjusts to the angle and height of the bass drum hoop (ensuring that the pedal remains flat). Further drop-downs include the low friction Speedo-Ring and Spring-Tight, a specially-shaped rod which prevents the spring from twisting. As well as the strong visual resemblance to the 900 pedals, the new model successfully captures much of the solidity that is one of the defining characteristics of Iron Cobra pedals. They feel planted underfoot, as though they have sunk foundations into the floor below. The 600 does a decent job of reproducing the level of effortless power normally found in Iron Cobras - not surprising considering its double chain. The action feels smooth and seamless and, when the beater makes contact with the head, it does so with what seems like a disproportionate amount of force. 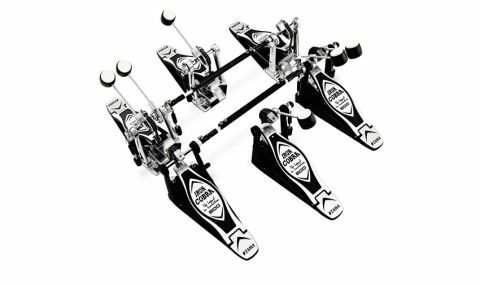 With the Duo Glide Cam set on Rolling Glide the pedal is perfectly balanced and responds eagerly to every twitch from the foot. Switching the cam to its Power Glide alternative invokes a more aggressive feel which is more suited to rapid fire bursts of intensity. The Conspirators drummer Brent Fitz - "I talk to Slash about this. We both go, ‘Man, I was nervous tonight"